The Acme in Ocean City, New Jersey, stands as one of the most fascinating pitched-roof conversions in the entire chain. The original store has been on this property for 43 years now. Back in January of 2000, the pitched-roof store was closed and construction for a massive expansion and remodel began. 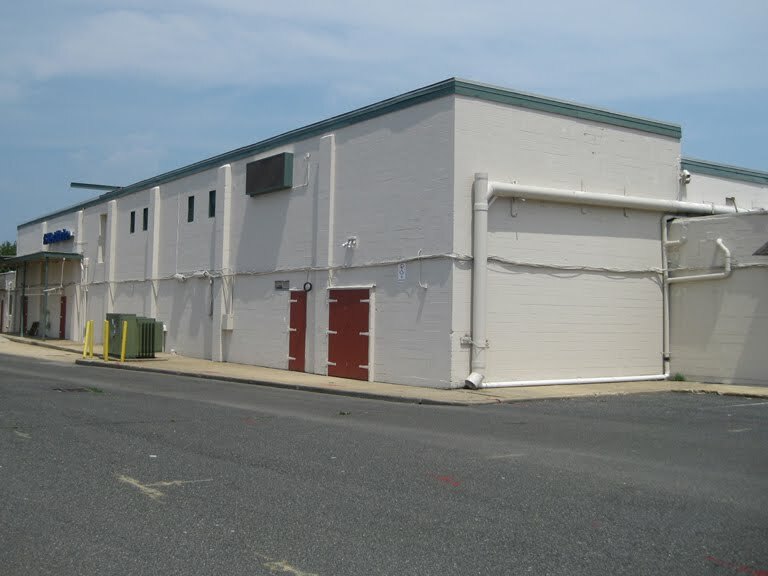 Final size: 33,250 square feet. 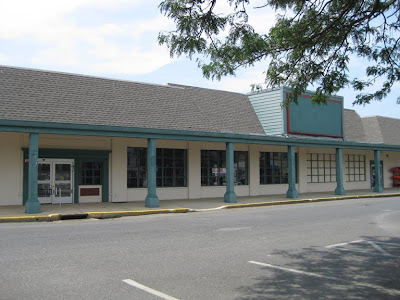 The nearly-new store held it's grand reopening on June 16, 2000 at 7:00 am. 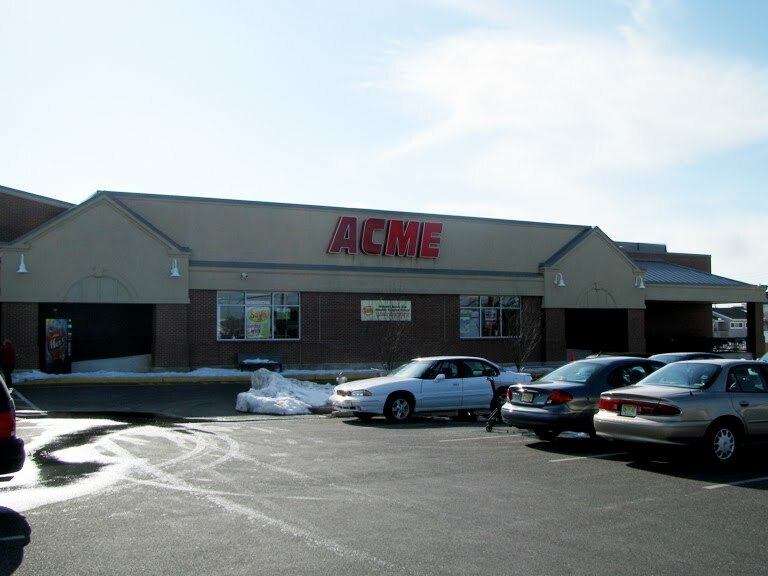 The brand-new section of the Acme is seen here. 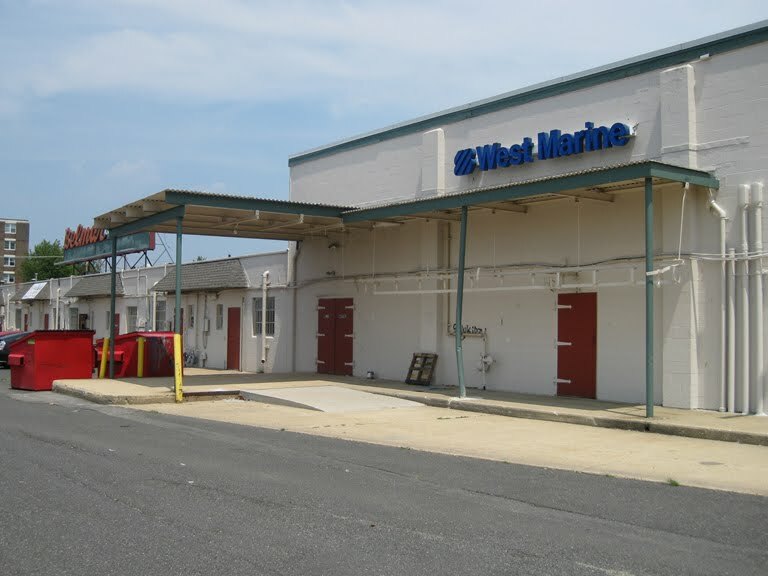 All the service departments were moved to the new addition. The pitched-roof half houses most of the grocery aisles and checkouts. 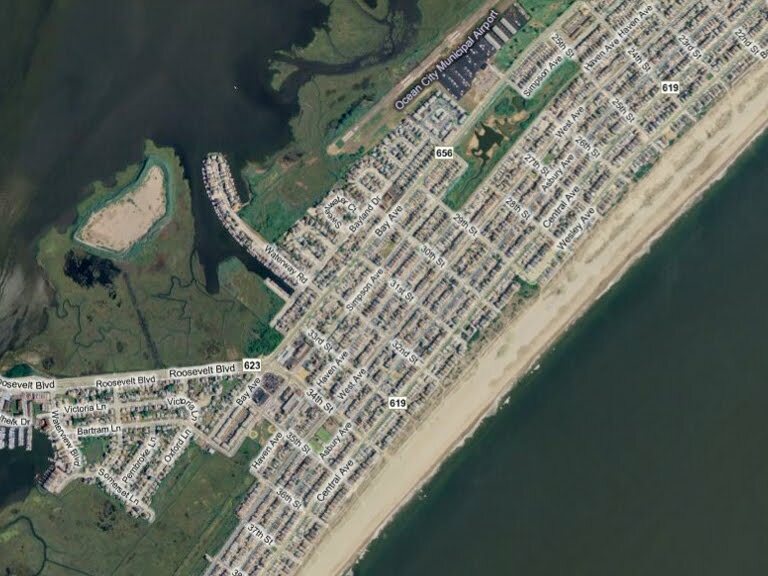 Ocean City is one of the very few pitched-roof conversions were the original building was not disguised with an awning. The conversions that occurred during the 80's remodels erased all evidence that the stores were ever pitched-roves.... with the exception of the back of the store. Princeton Junction, as seen here, is great example of the 80's conversions. 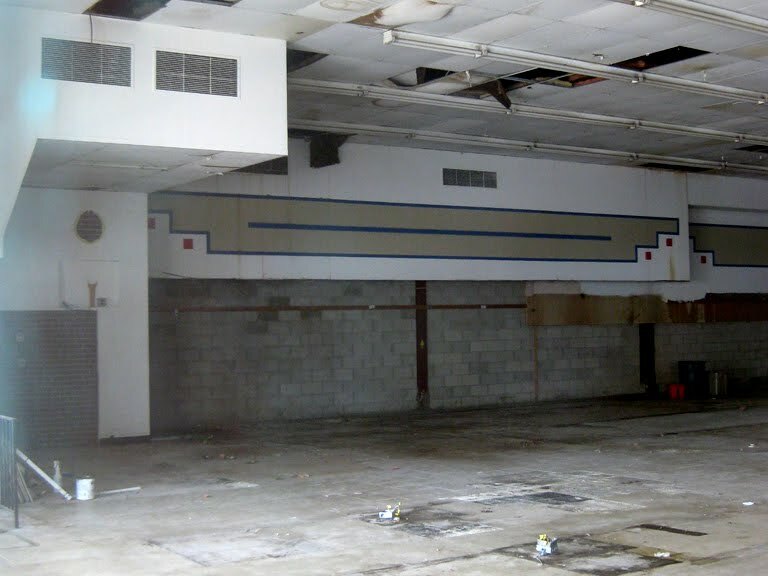 Not only did they not cover up the pitched-roof section, they left the ceiling inside completely intact! 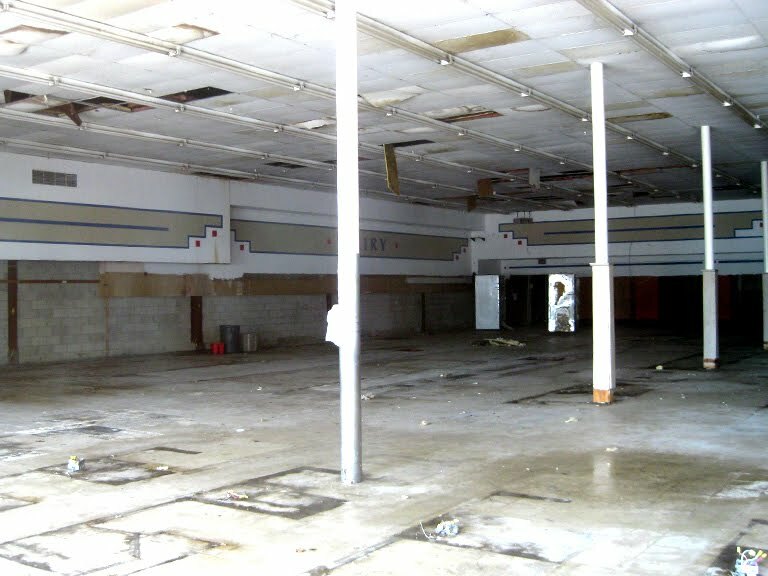 No drop ceiling. Granted, the facade of this store is a bit odd now, I do think preserving the original structure in this manner allows this Acme to remain a very unique store. It is nice seeing the old joining the new here. Check out the colors! Quite impressive indeed. During the 2000 expansion and remodel, the Alberston's Marketplace decor was put in. 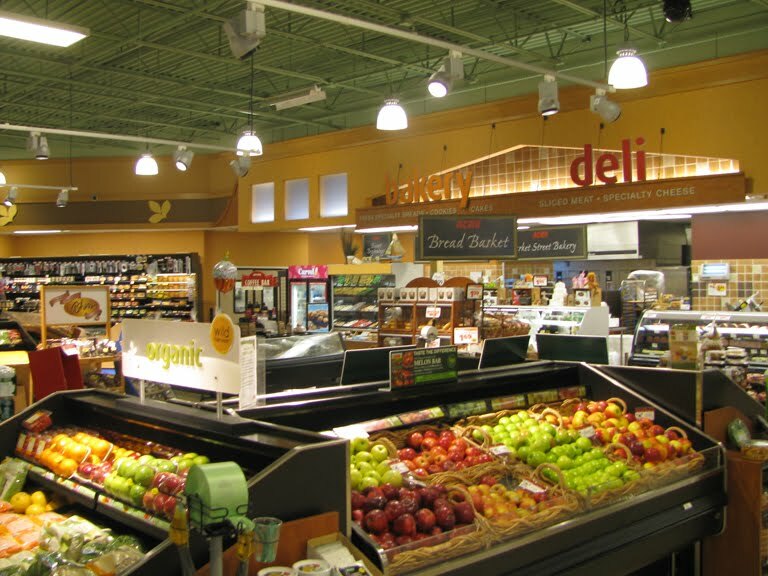 Recently the store was upgaded to the Premium Fresh and Healthy look in preparation for the new ShopRite opening in nearby Marmora. You can see the nuts and bolts of the Albertson's Marketplace decor still in place. Department lettering has been switched out and the iron-like sculptures over the blue boxes have been removed. One unfortunate addition... the Albertsons leaf planted up on the walls. 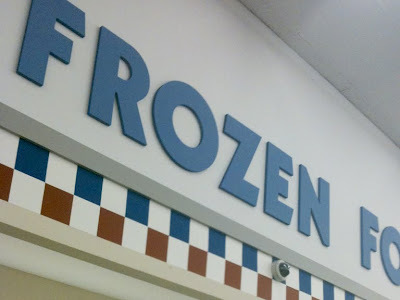 I'm not a fan. A lot of Acmes have been getting this upgrade in the last few years. 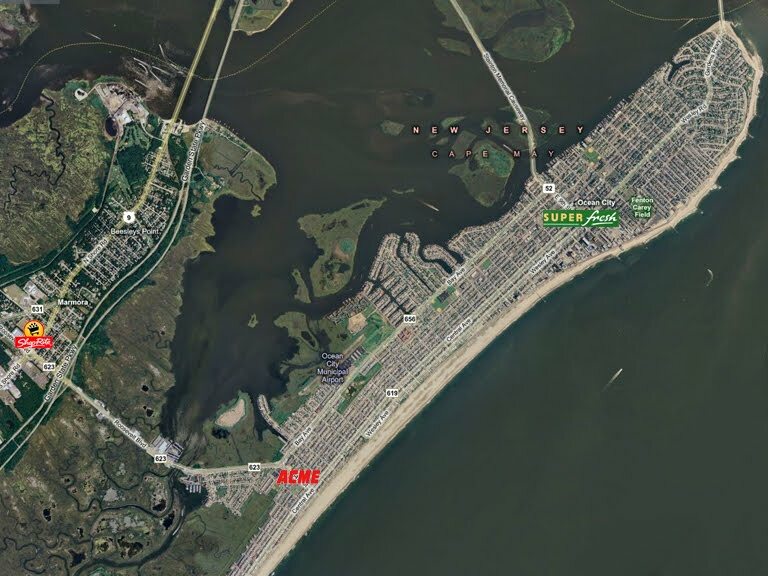 This location has been one of the most successful upgrades I've seen. Earlier remodels were lacking in color and came across as cold and sterile. 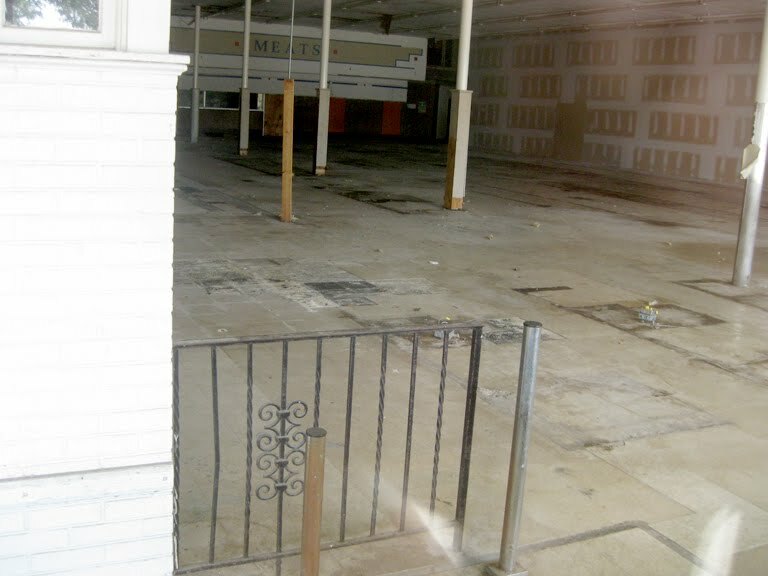 Looking out into the old pitched-roof building. 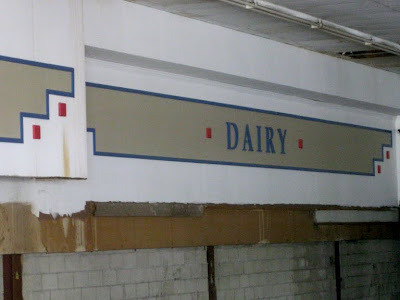 I believe the Dairy department is still in it's original location. 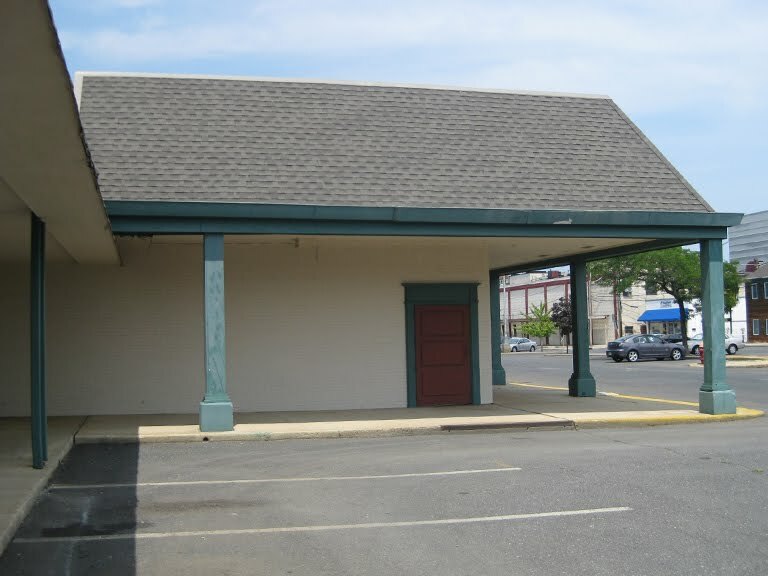 The old entrance and exit would have been straight ahead and behind the original Customer Service Office... if we are to assume this had the layout of most pitched-roof stores. Correction: The Dairy department is probably not in it's original location! 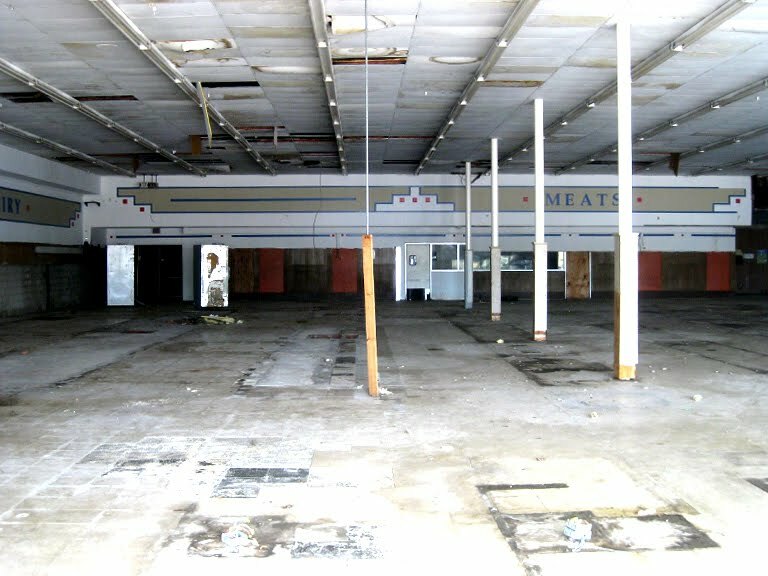 The Meat Department shot above shows doors to the backroom along the current Dairy wall. Doors to the backrooms were along the Produce wall in the old pitched-roof stores. 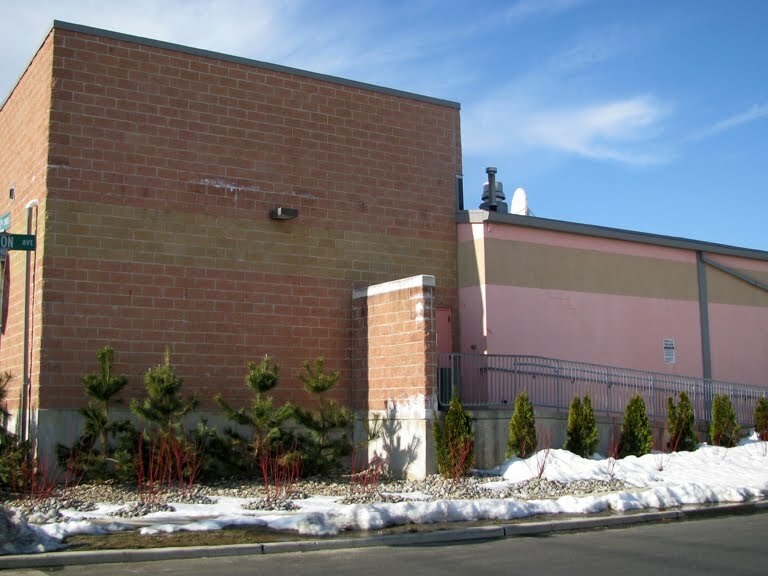 Dariy was always ran along the exterior wall of the building. 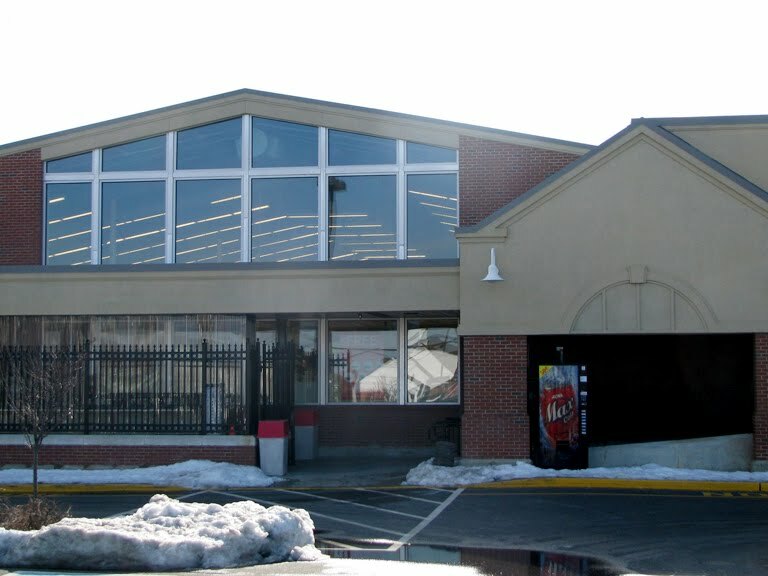 Front end of the store from the new into the old. 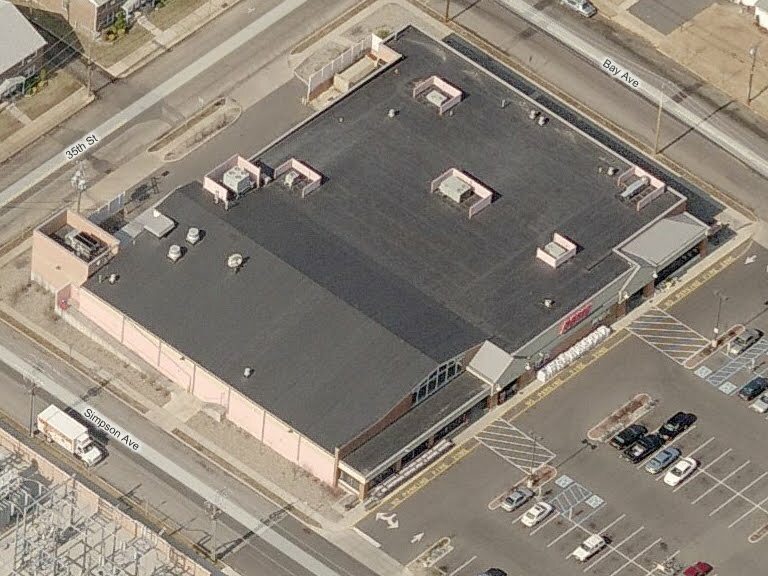 Nice to see the old pitched-roof store looking so good 43 years later! Too bad there weren't more of them around that have been so well cared for. 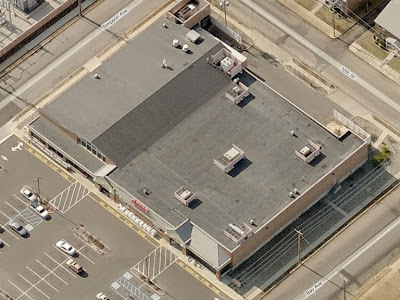 I have posted aerial shots of this store before when I first discovered it. 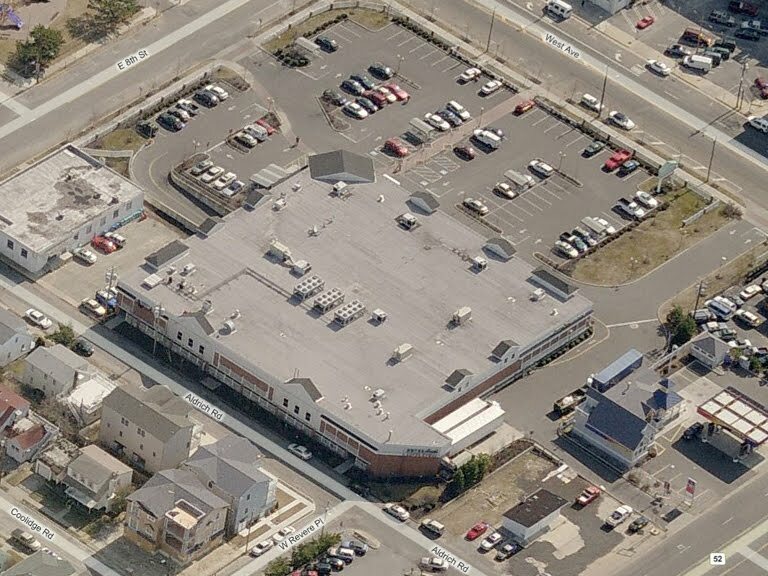 Couldn't believe my eyes when I saw the conversion that was done here. An interesting side note here... 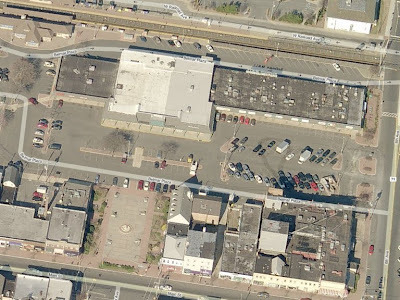 I read that the town reconfigured the entrances and exits to the parking lot in preparation of the Acme CLOSING when the new ShopRite opened in mid-2009. 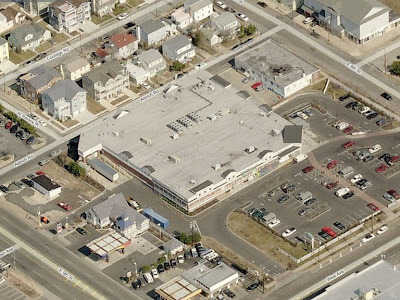 Rumors were that Wawa was interested in the location and the town was planning for the changes. 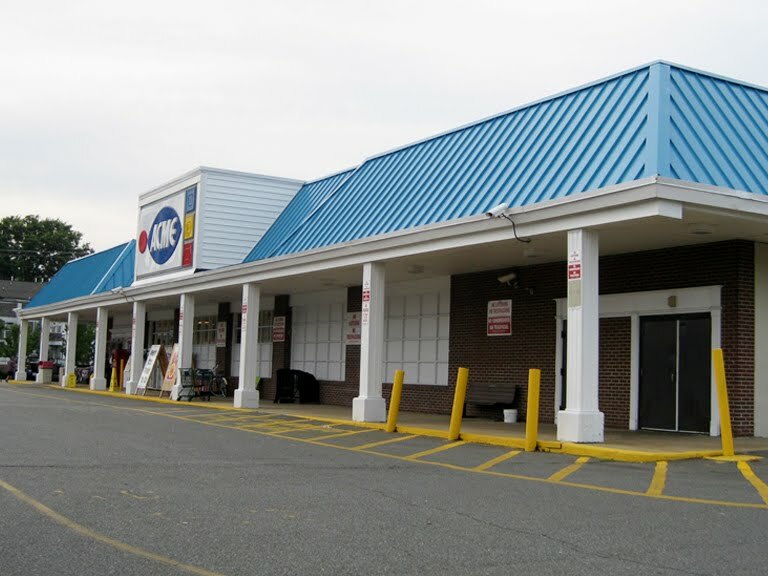 Acme answered back by saying they had no plans for closing this store despite the competition coming from a new ShopRite. In fact, they were in the process of remodeling this store with the Premium Fresh and Healthy decor and we're very committed to keeping this location a success. The Acme is located at 3428 Simpson Avenue, Ocean City, NJ, right at one of the main roads that leads to the Island. 5 blocks in from the water.. for those keeping score. 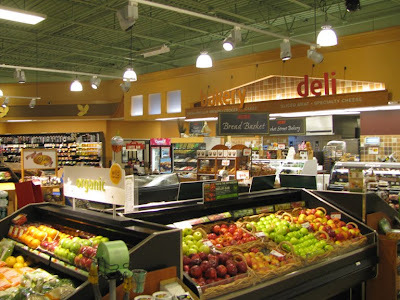 The other grocery store on the island... SuperFresh! 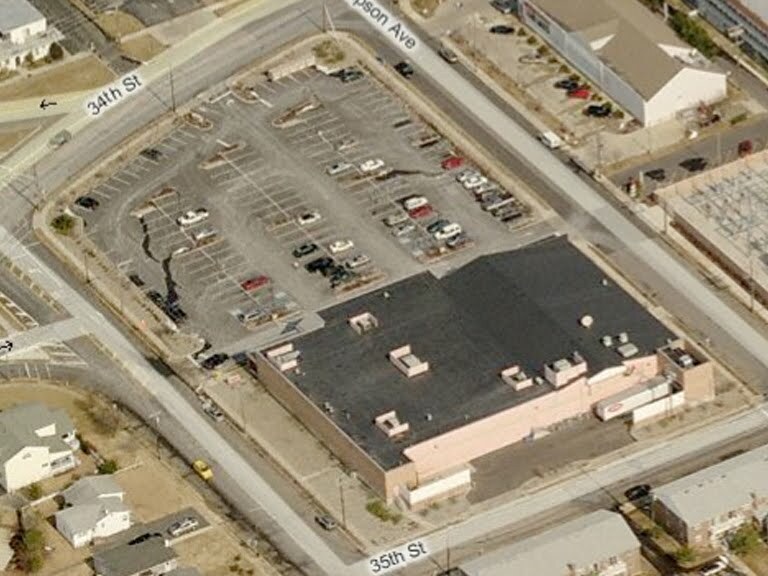 Located about 25 blocks North of the Acme. If I have my stories straight... the original store was town down and this new one was built. 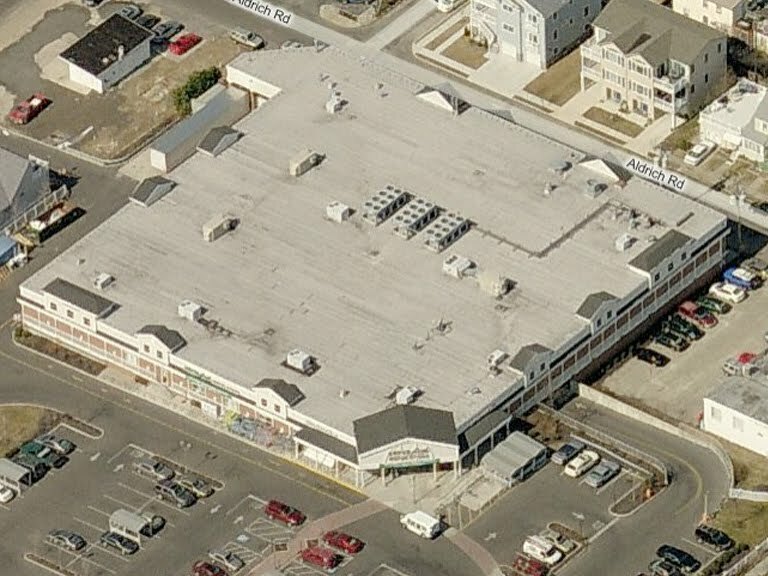 Here's a look at the grocery store situation in Ocean City. 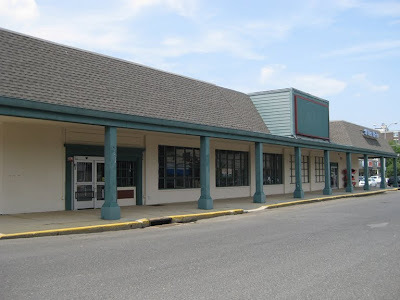 The ShopRite is not in Ocean City but must certainly be impacting the stores that are. (The ShopRite is so new, it's not showing up in satelite images of the area.) I'm curious to know how much longer the SuperFresh brand will be around for. 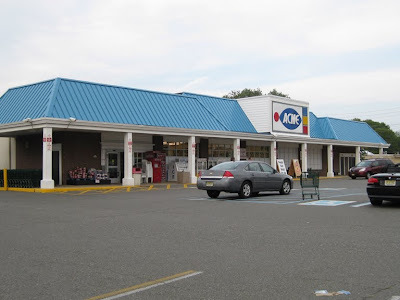 Their numbers have dwindled extensively since A&P bought Pathmark. Most SuperFresh stores in the Philly area have been converted to Pathmark Sav-a-centers. NEW AND IMPROVED interior shots! The Belmar Acme first made it's appearance here on the blog back in February 2009 when Acme Style was just getting it's feet off the ground. Looking back, the pictures for the original post were kinda lame. I wasn't as adventurous with taking the pictures in the beginning. 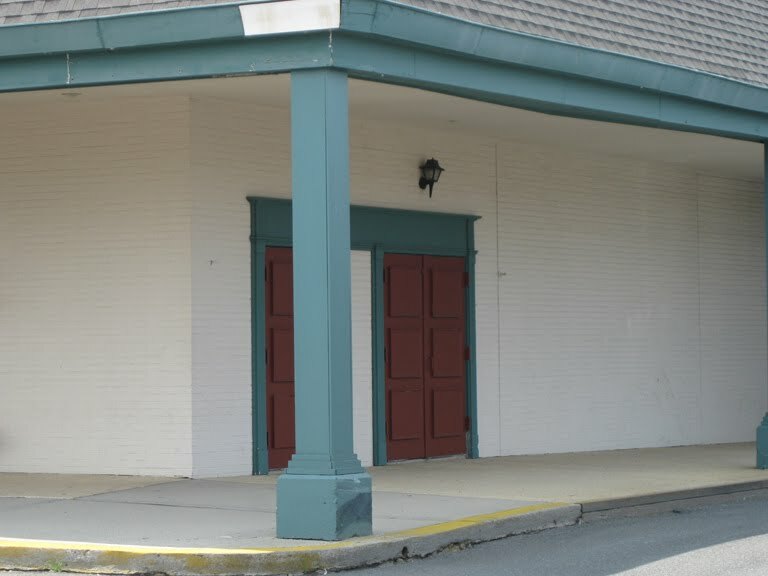 These days I take much more time trying to capture the finer details of these old stores. The sun was definitely more cooperative on this trip as well. 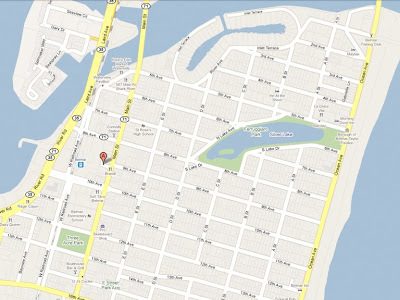 You can view the original post by clicking here. 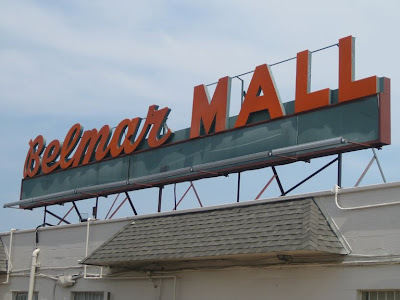 As you can see above, the Belmar store had the red oval logo sign which came along with the 80's remodel. This store was not remodeled in the 80's. 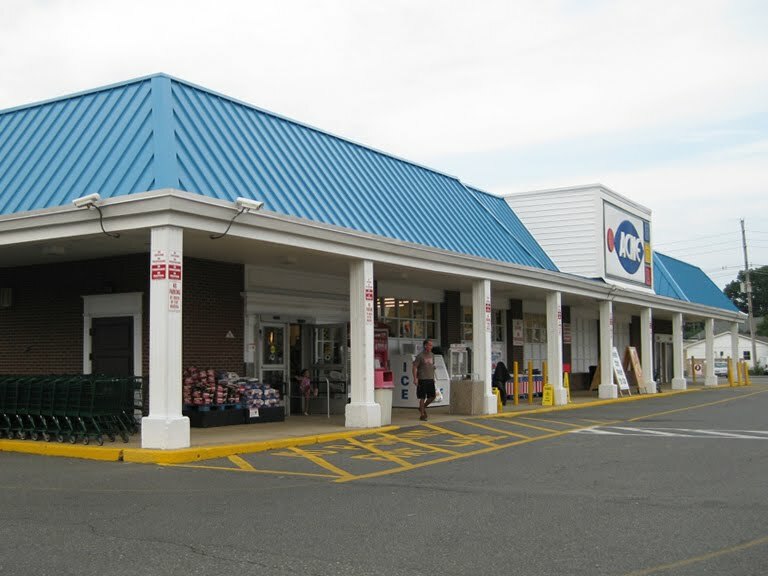 It's Colonial Decor was traded out with the Convenience Store Decor of the late 90's, as you will see down below. 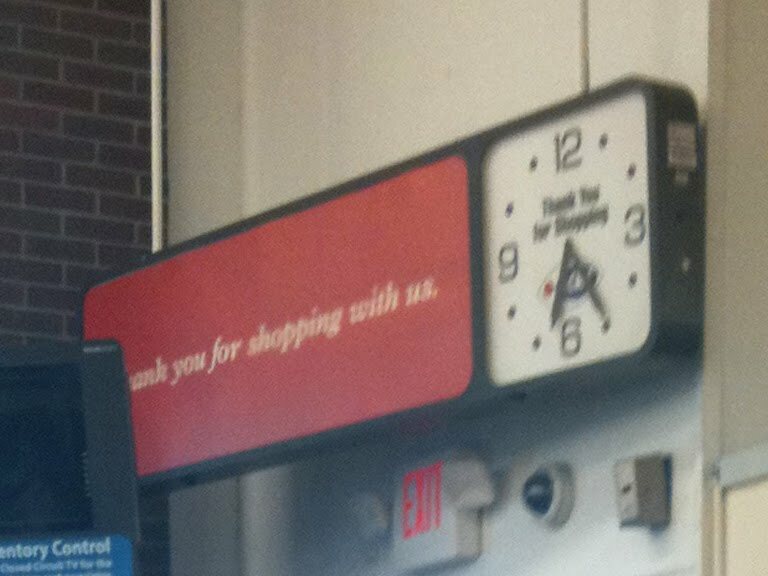 Not sure of the exact closing date here. Most likely in the early 2000's as Albertsons pulled the plug on many older Acmes. Bread delivery door to the Acme. 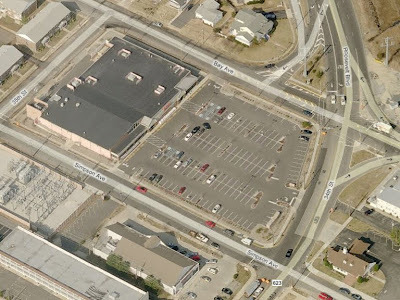 The section the to left was a Rite Aid which just recently relocated to Main Street. The building the Rite Aid moved into may very well have been an Acme. 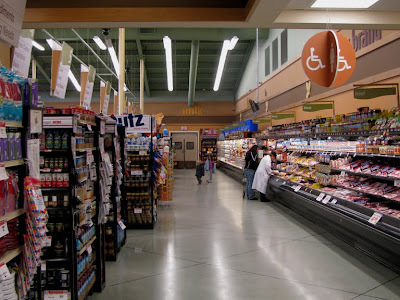 It's small but has the signature air vents and certainly has the feel of an old grocery store space. 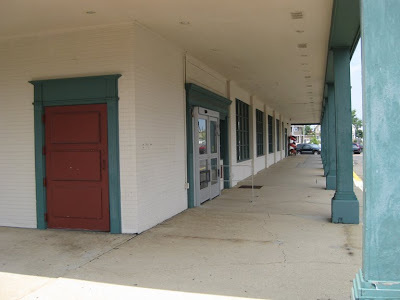 Remarkably clean and nicely painted back of the store. This area is highly visable to passing trains and roads on either side of the shopping center. NJ Transit train tracks are just to the left of the photo with the train station just behind where I was standing. 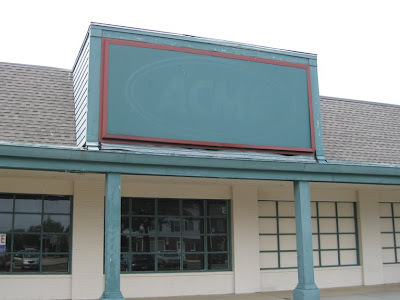 Blacked out Acme sign along with the breakroom & employee bathroom windows. 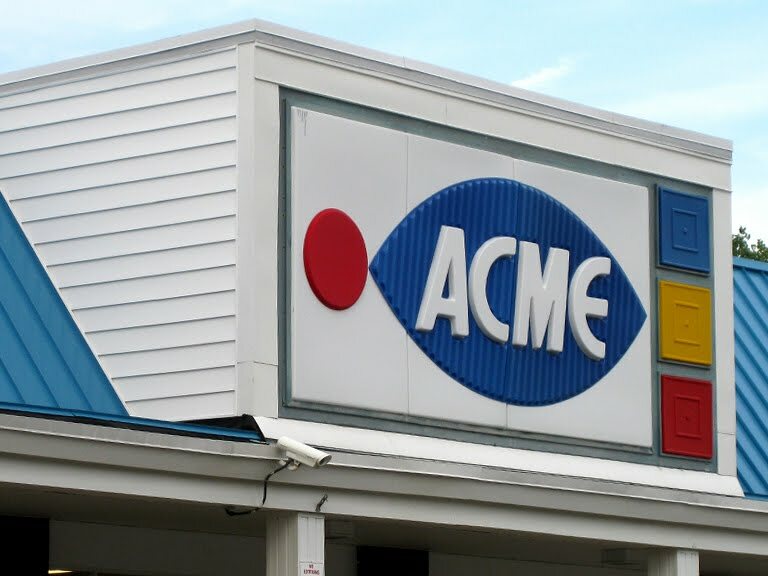 Acme awnings still intact. 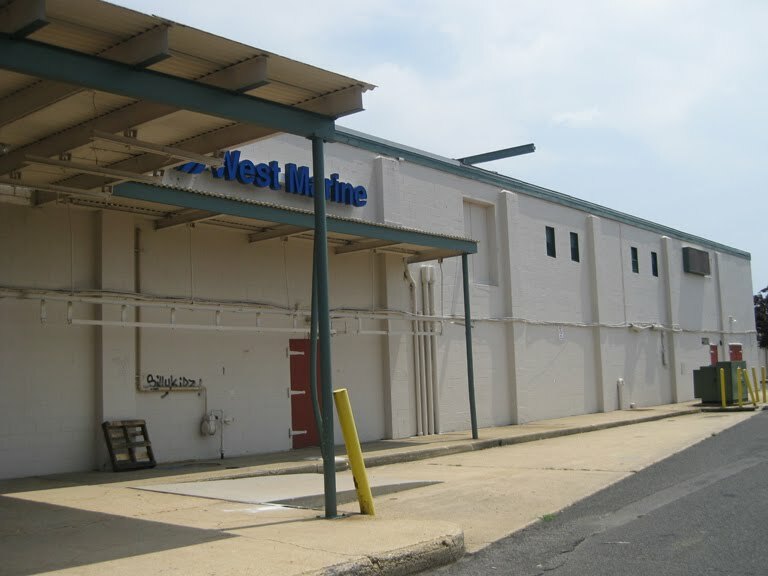 West Marine boating store takes up about half the former Acme space. I believe the metal beam sticking out at the top was for lifting compressors to the second floor. These beams were commonly seen at the back of the pitched-roof stores. 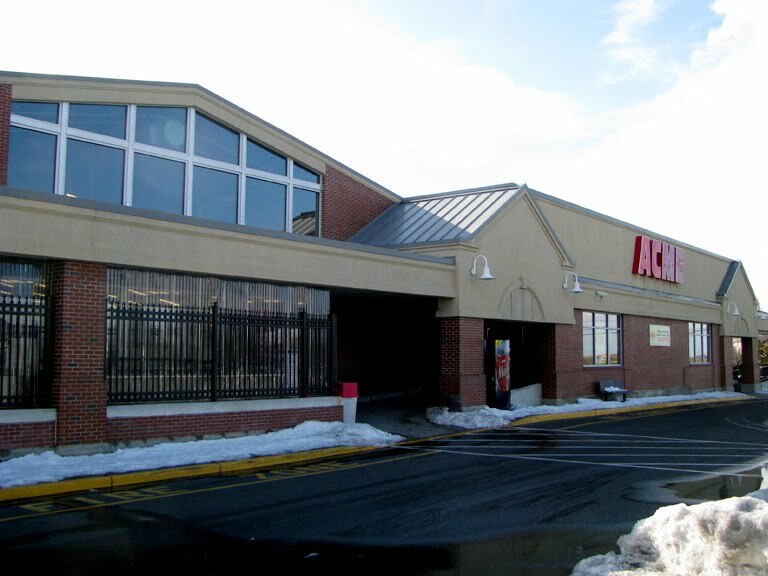 I have been wanting to give this model of Acme Markets a name... and I think I have come up with one. The Colonial Cottage. This building style was rolled out after the pitched-roof model was retired in the late 60's. The Colonial Cottage model included the "deluxe" version of the Colonial Decor... which I have no pictures of other than the Produce floor which can be seen here. 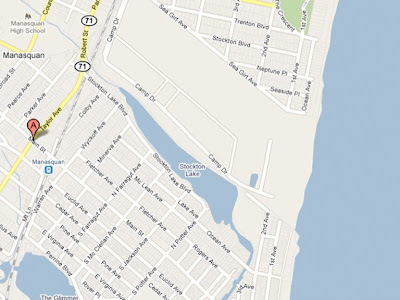 Manasquan is the only unaltered Colonial Cottage still open. 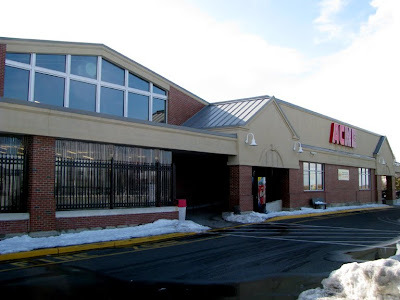 The Acme in Dresher Pennsylvania is the same model but the awning has been upgraded costing it some of it's charm. 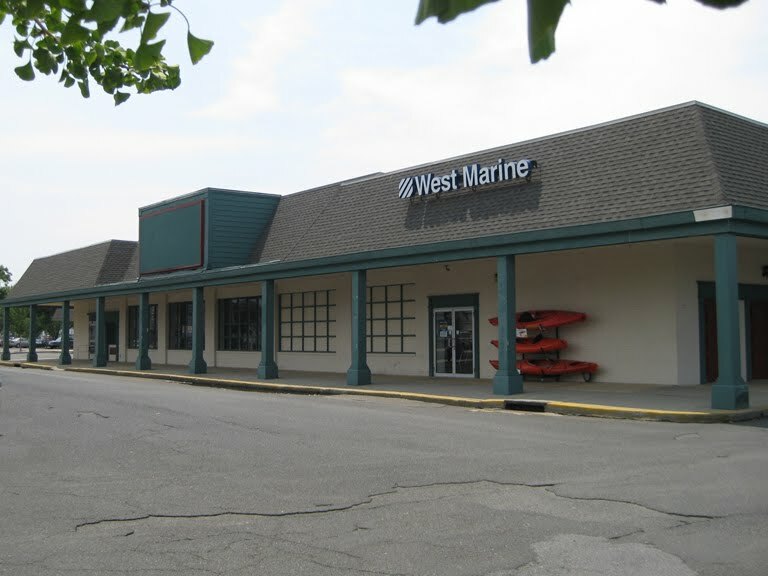 There may be other stores that started out with this model but have had extensive renovations and additions. 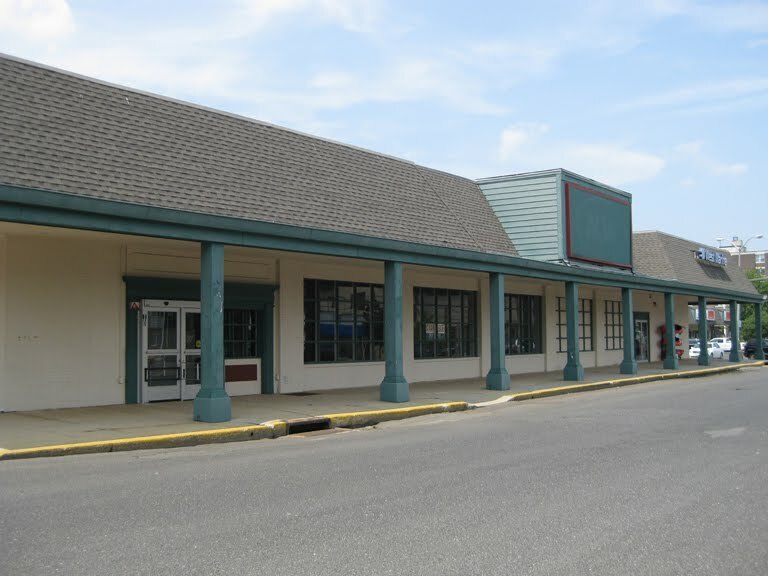 The Belmar store looks to be nearly identical to Manasquan although it doesn't extend as far back making this store smaller in size. Looks as though the width is about the same. 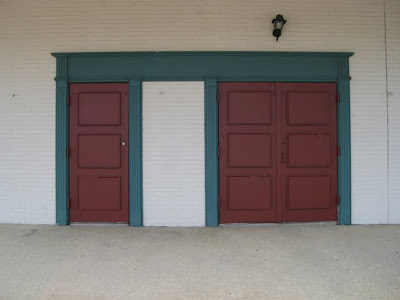 The Colonial Cottages had only one set of doors on the outside. There isn't a second set of doors inside much like how the pitched-roof stores were set up. 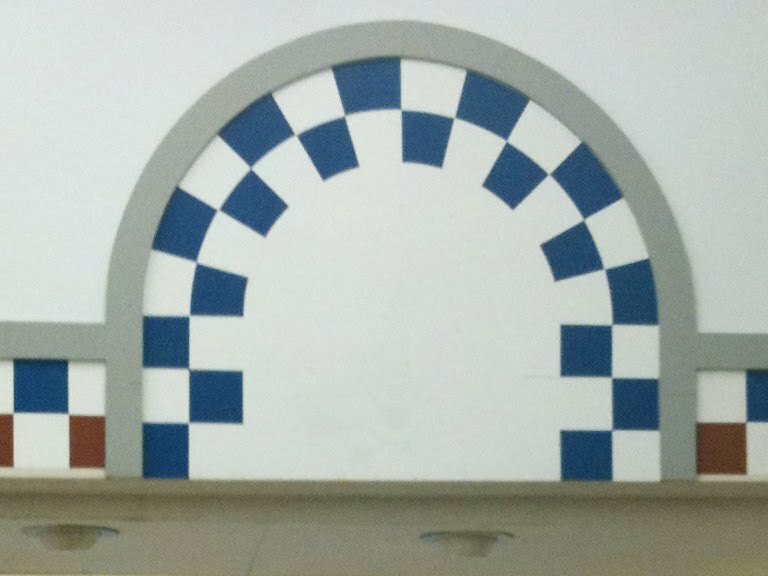 The wall as soon as you walk in. Shopping to the right. 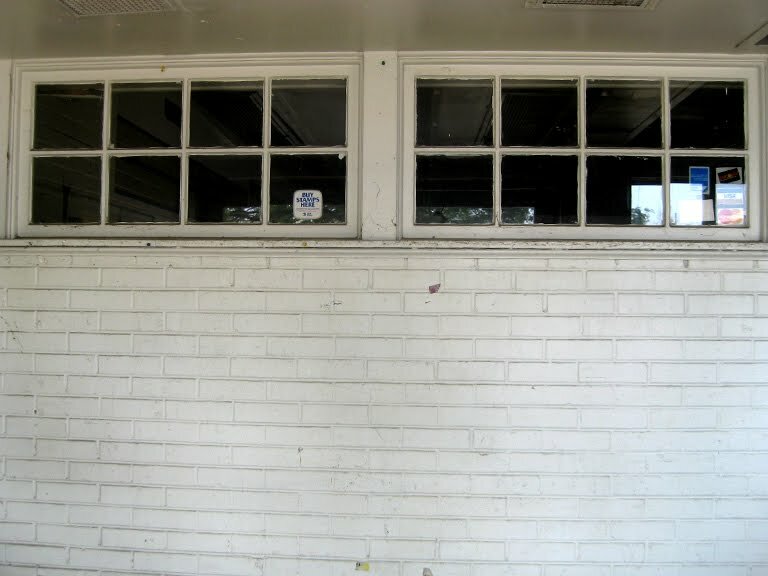 The windows are in the manager's office. 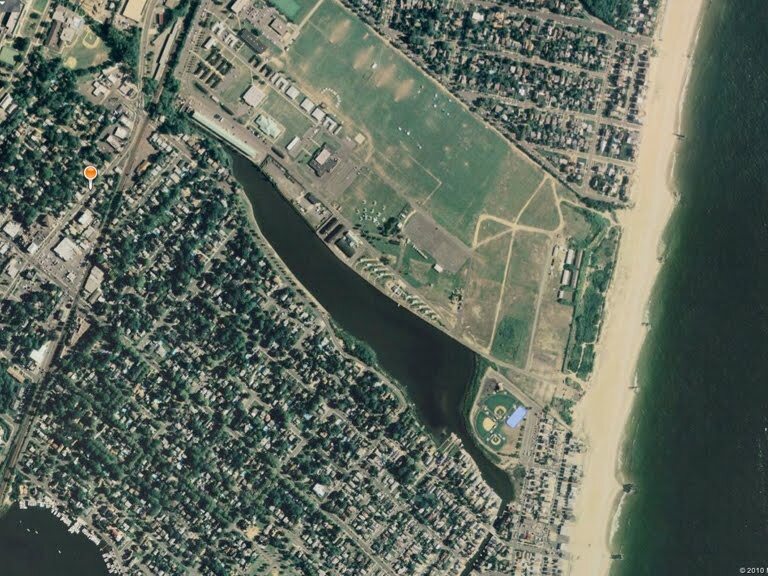 Manasquan has the same exact set up. I tried to snap a picture there but two employees kept looking out the windows. One who seemed to think I was up to something. Can't imagine why. 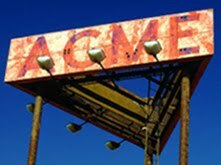 The famous Acme railing! A section has been removed here. 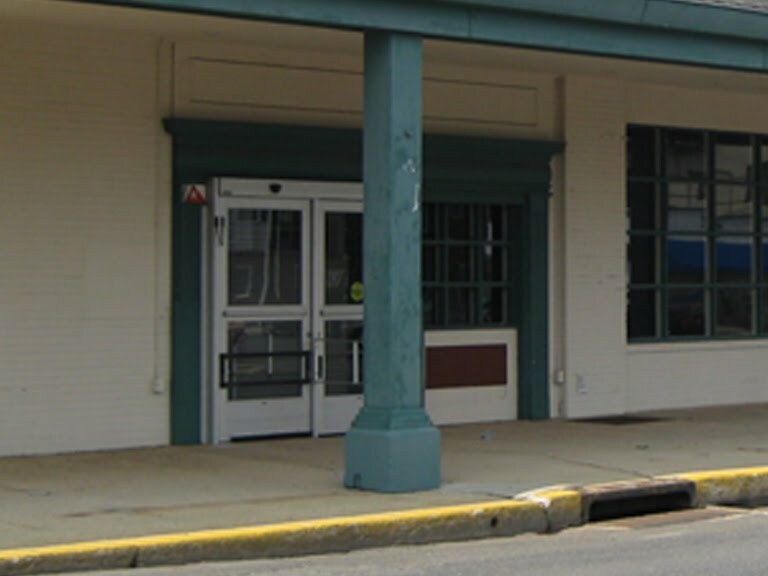 The railing helped keep customer flow straight along the front of the store and over to Produce. 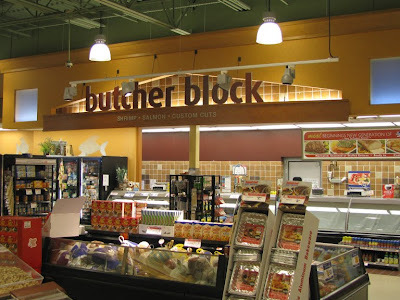 No cutting to Dairy from here unless the first register was closed. The Convenience Store decor saw the end of the "Bakery"... unless there was an in-store Bakery. 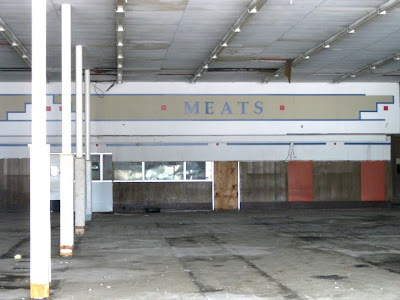 The Colonial Decor's brown and orange paneling still in place along the Meat department wall. 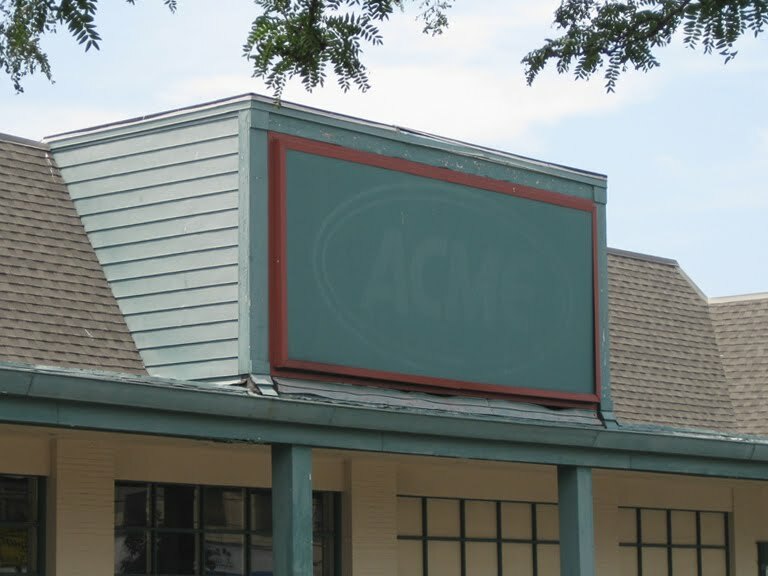 You can see here how the Acme was set back from Main Street. I drove by this site for years before I turned my head and saw an abandoned Acme sitting there! 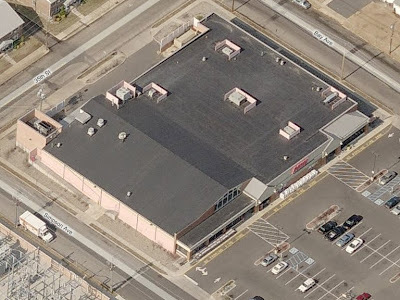 6 long blocks to the beach from this former Acme. The sign over the back of the strip mall to the right of the Acme. The exterior has had no major changes since the store first opened. 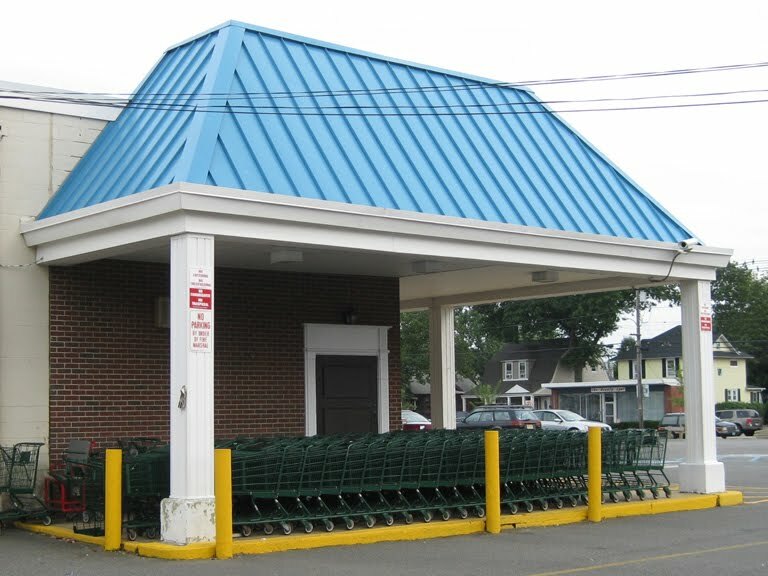 The roof over the awning has been covered in blue siding but no additions or substantial reconfigurations have been made to the outside. 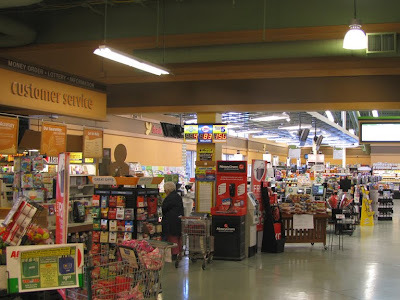 The original interior layout remains virtually intact for the entire lifetime of the store. 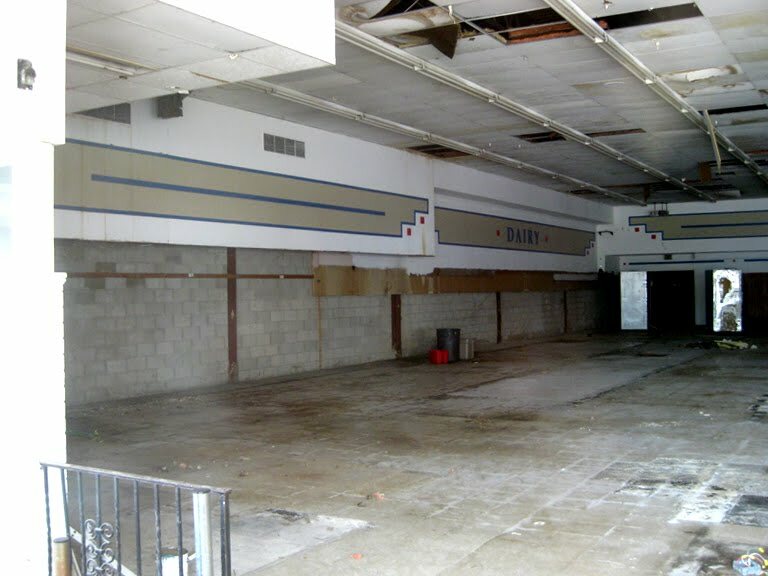 This store has never had a floor to ceiling remodel. Upgrades and decor changes have been done but no significant changes have been made to the layout. Sections of flooring have been switched out but the original Produce "faux slate" floor remains and is in remarkable condition. 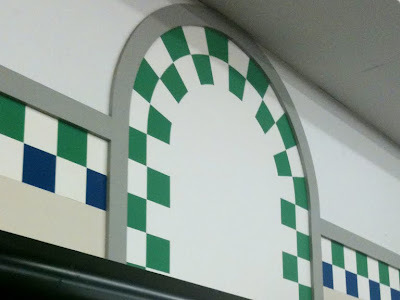 The other Colonial Decor colored tile sections in each department have been removed. 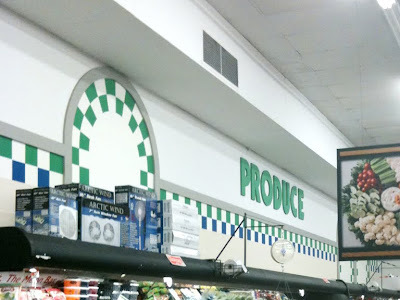 A Produce alcove was never created in this store. Produce still lines the wall along aisle 1. 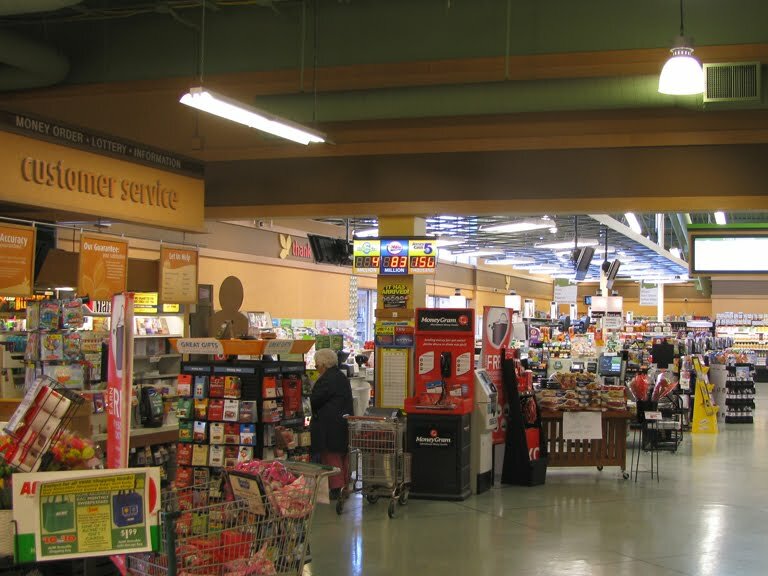 The original recessed spot lights above the Deli department remain. Customer Service and registers have been updated although the layout of the front end remains mostly unchanged. Best grocery store sign ever. Period. 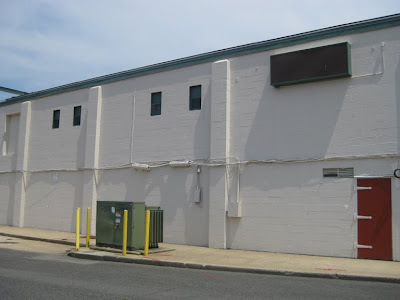 The old bread delivery door here on the side. 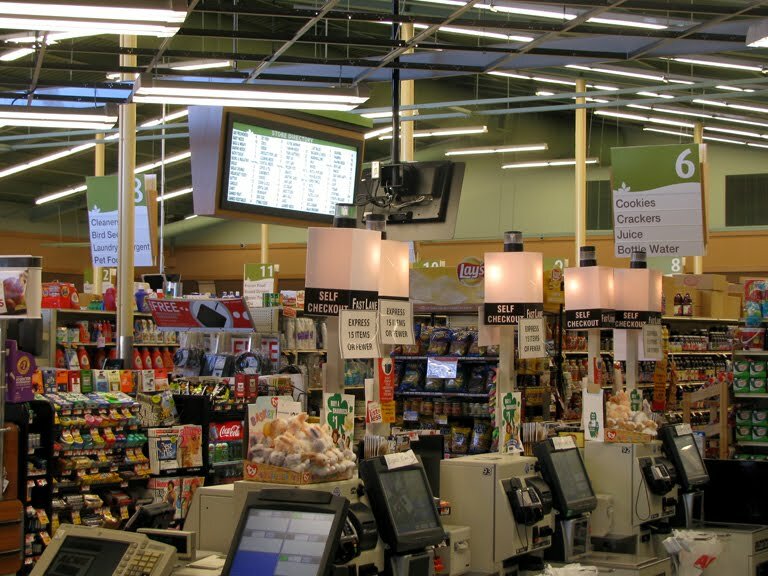 The bread delivery room is now used for the store's computer system. 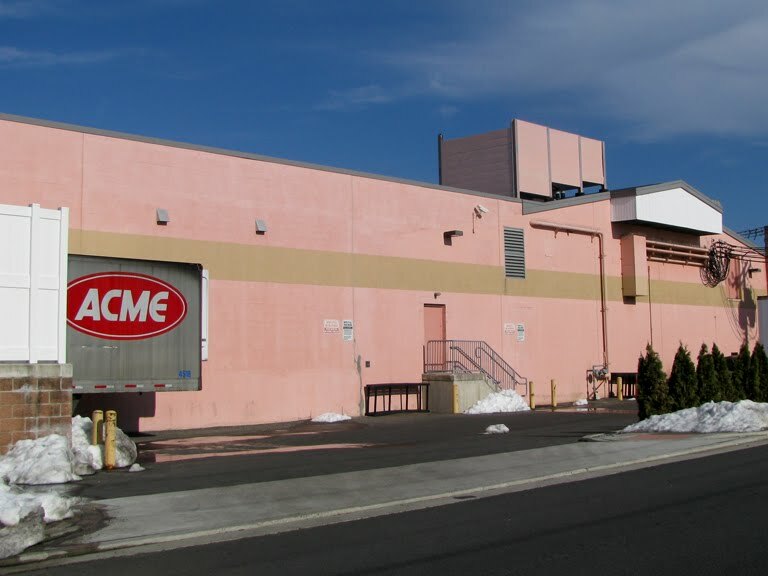 Produce receiving doors here on the right. Front windows have been covered over like in so many old Acmes to allow for shelving on the inside. 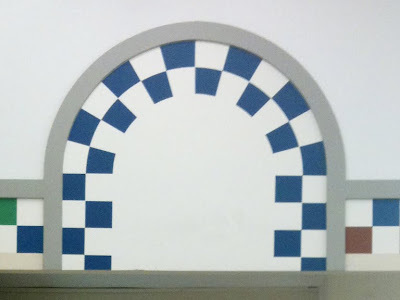 The Checkerboard Arch decor... an Acme Style favorite. 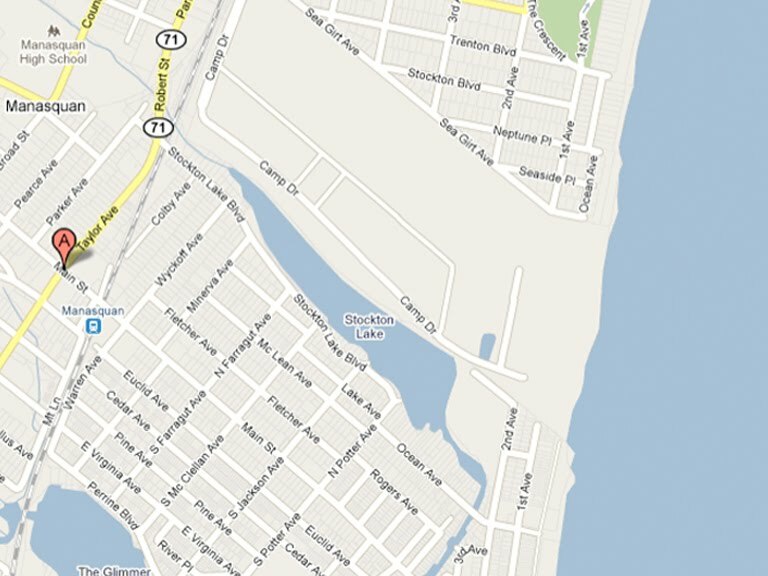 Very few interior shots were posted the original Manasquan post so I will be making up for that in this post. Plus, I have a much better camera on my cell phone these days. Notice the signature Acme vents along the top. 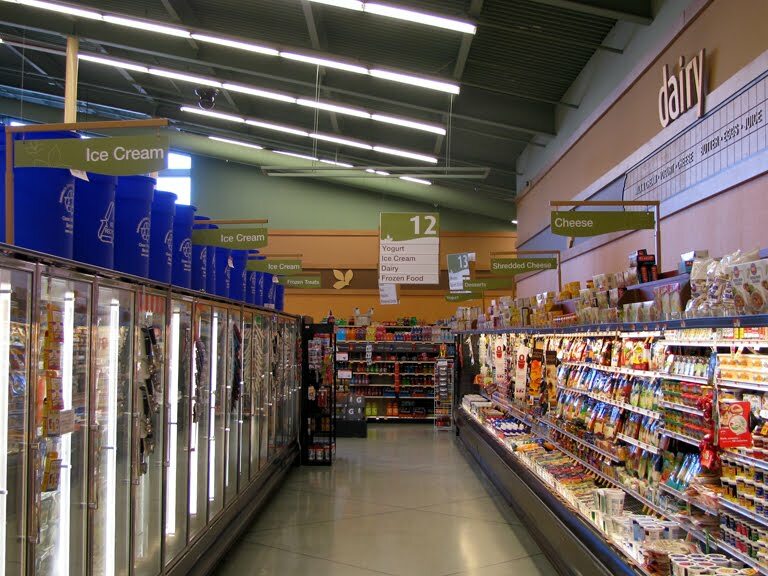 Produce and Dairy cases appear to be quite new. 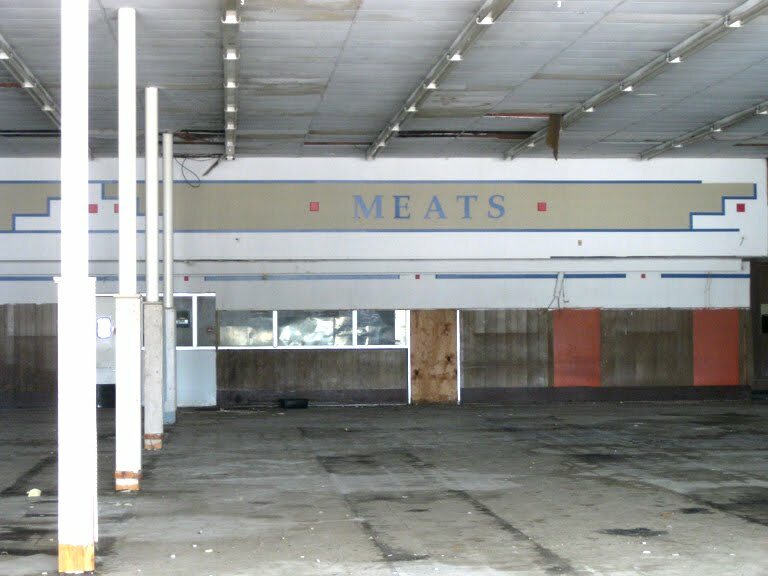 Meat and Frozen cases appear to be from the 80's remodel and were probably brought in from another store that closed. 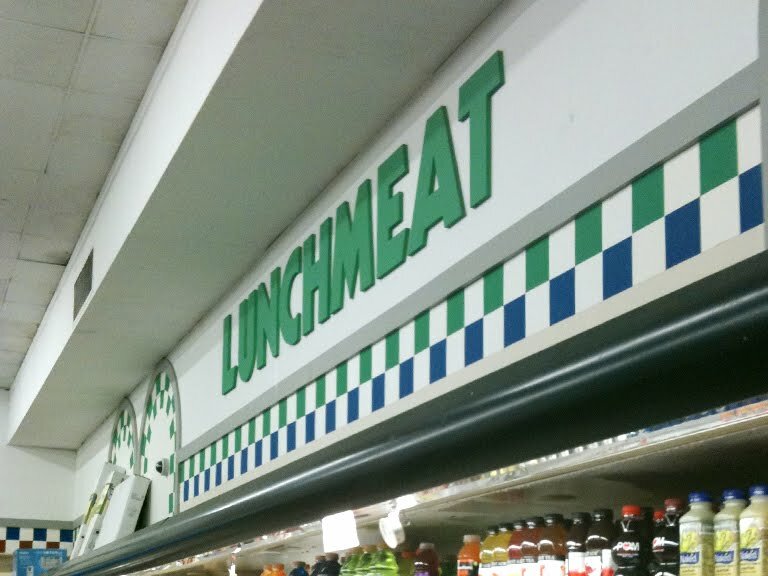 This store was not remodeled in the 80's. 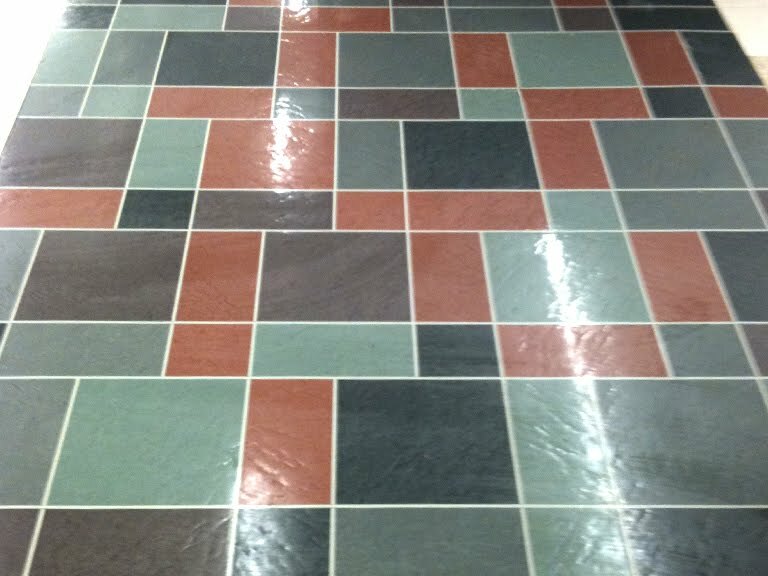 The Colonial Decor "Deluxe" floor. Quite a site. Still looks great in this store. 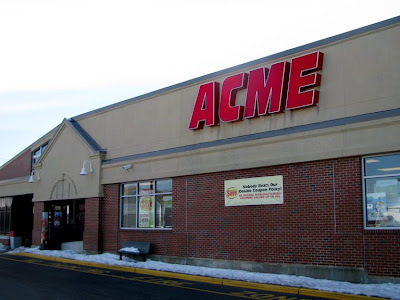 This was one of Acme most signature deign features in their stores during the 70's and early 80's. 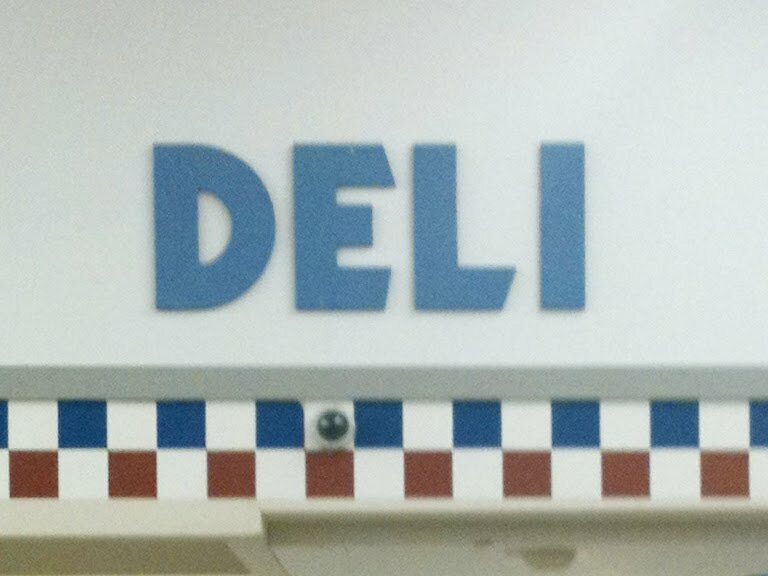 The original Deli lights there in the drop ceiling. Would you look at this. Aisle markers from the Industrial Circus decor package have been brought in probably from a closed store. The last time I was here the aisle markers matched the decor. Not anymore. Kinda baffles me. Now the aisle markers hold less categories and clearly don't match the decor of the store. Newer isn't always better. Although this look is a little dated now, it was the perfect fit for Acme when it was rolled out in the early 90's. 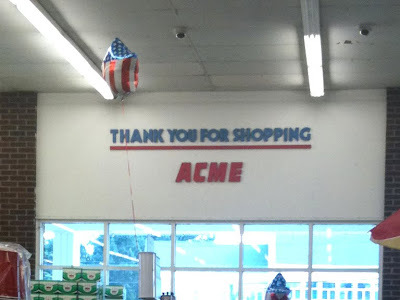 The deluxe version had many nice touches and the overall look was one of the best fits to Acme's personality that the chain ever had... in my opinion anyway. 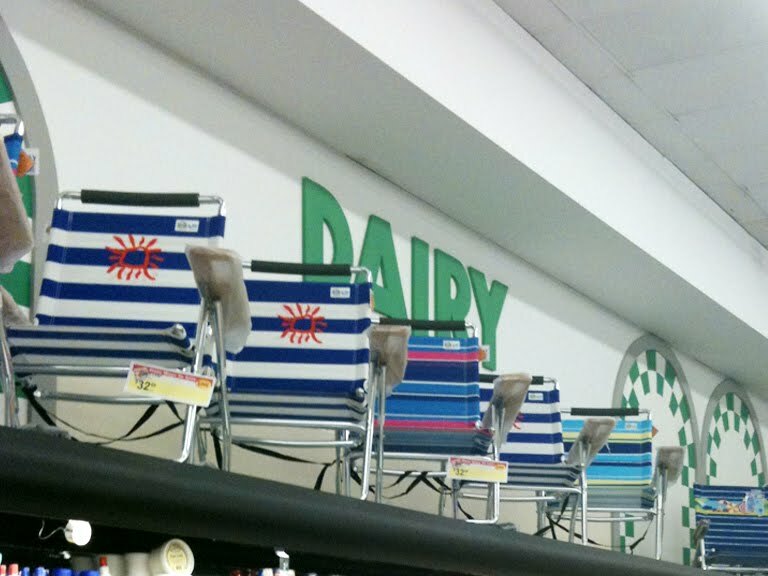 This Jersey Shore store is loaded with beach chairs. 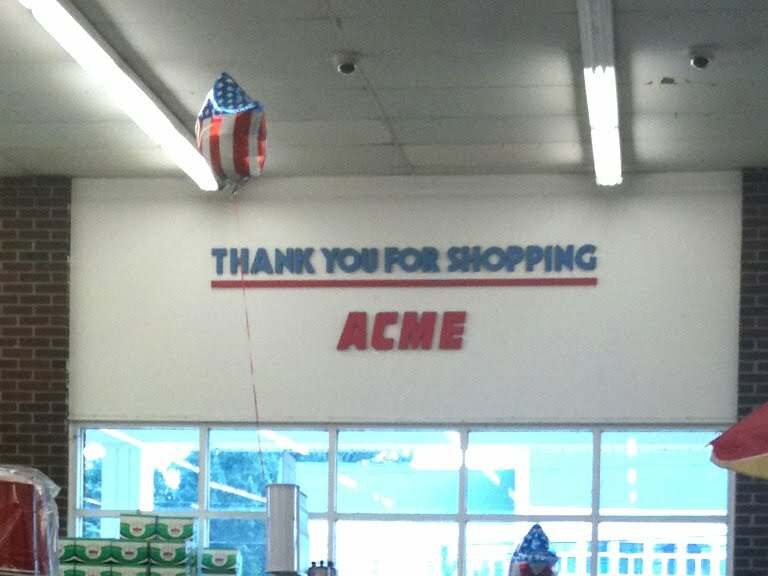 And with this decor, Acme raised the department names to the roof line so they could still be seen with tons of general merchandise stacked on the cases. 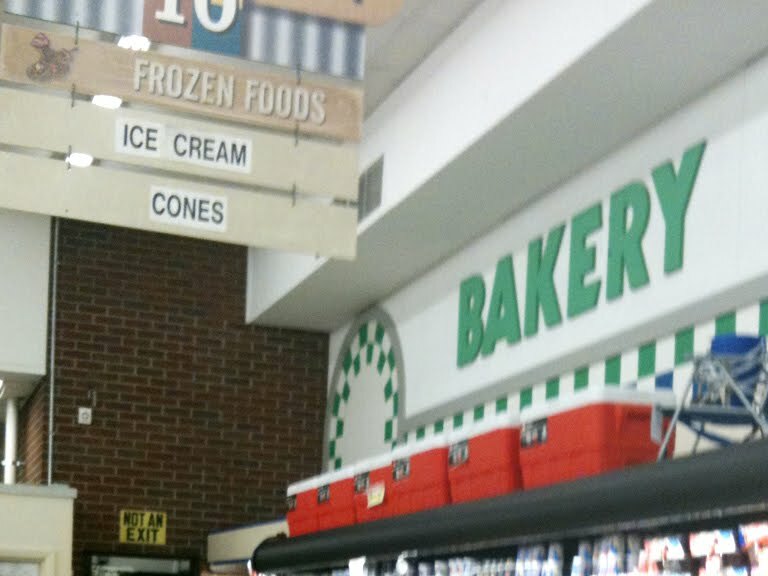 "Bakery" is now all Dairy. 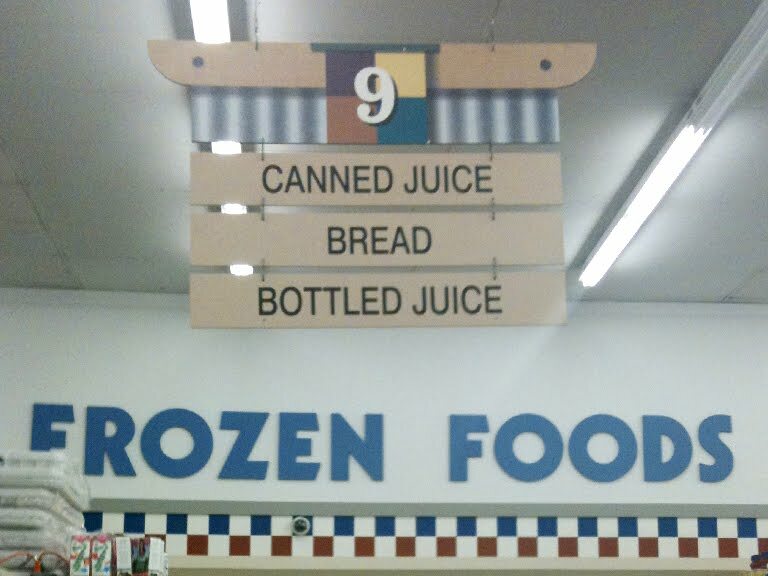 Bread is over in aisle 8. 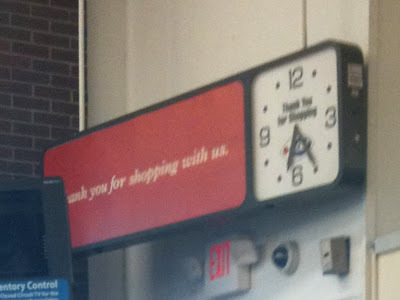 The old fish-eye Acme clock. Every store had one. Ads were placed in the red section but I'm sure whatever company took care of that is long gone these days. 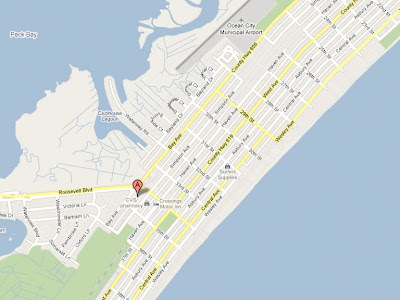 This Jersey Shore store is not quite within walking distance to the beach. May not be alot busier in the summer than the winter. 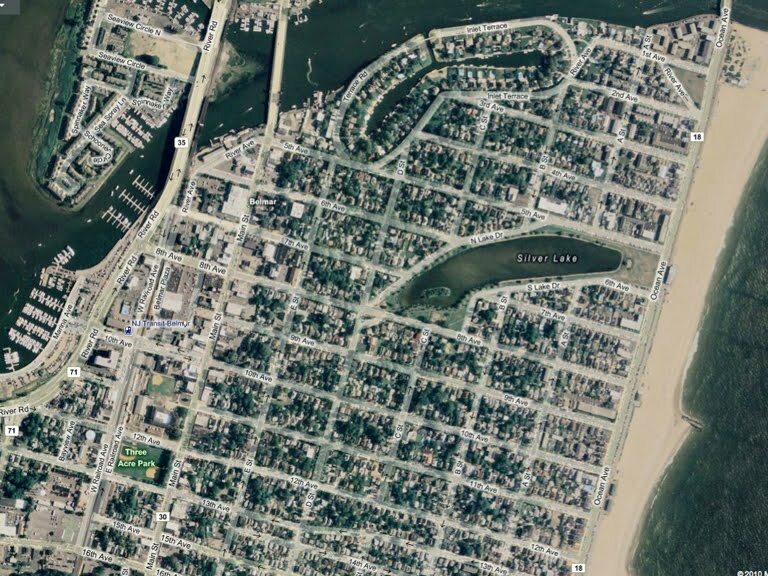 Manasquan is more of a regular town than a summer resort town. 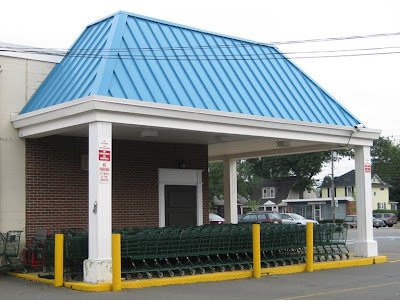 I was surprised at how many other grocercy stores I passed driving through a few towns North of Manasqaun... Foodtown, ShopRite, Super Foodtown, A&P.